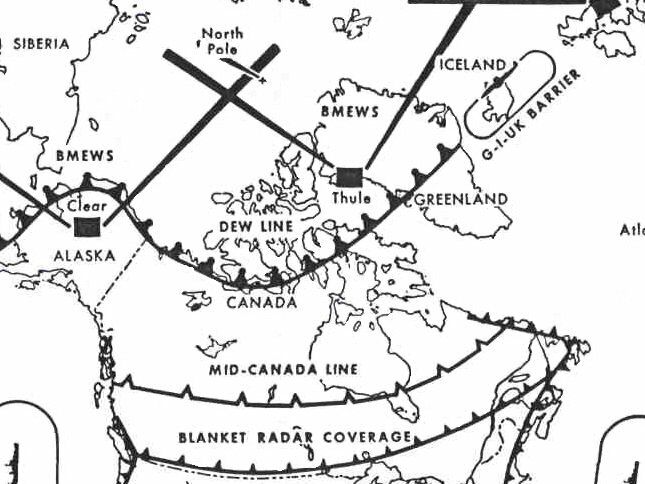 The radar warning network in defence of Canada and the United States consists of: a Distant Early Warning Line (DEW) extending along the north shore of North American mainland and terminating at Cape Dyer on Baffin Island; a Mid-Canada Line which is situated along the 55th parallel of north latitude; and to the rearward a contiguous radar system covering virtually the entire populated area of Canada and the United States. This latter radar coverage extends for hundreds of miles to seaward off the east and west coasts of the lower mainland. The line of radars from Frobisher to Red Cliff provides early warning and control of USAF interceptors based at Goose Bay and Harmon in Newfoundland. An Airborne Early Warning barrier between Newfoundland and the Azores provides early warning against attack from the North Atlantic. A similar Airborne Early Warning Line extends across the Pacific Ocean from the Aleutians to Hawaii. In July 1961 four heavy radar sites in Greenland (DEW East) will become operational and the Airborne Electronic Warning (AEW) barrier currently located between Argentia and the Azores will be relocated to close the gaps between Greenland-Iceland-United Kingdom (the G-I-UK barrier). In addition to the AEW aircraft there will be radar picket vessels patrolling the Iceland-United Kingdom Area. Thus, by July 1961 there will be a continuous early warning line against the air supported threat which extends from Hawaii to Europe. Attached as Annex 1 is a map showing the existing radar coverage in the Northeast Area and the improvements to the early warning system becoming operational in July of this year. The radars which the United States desire to inactivate are shown in distinctive coding. The line of prime radars extending from Frobisher to Red Cliff were constructed as an extension of the DEW Line to provide early warning of an impending attack from the Northeast on the populated and industrial areas of Northeastern Canada and the United States. The radars at Frobisher, and Resolution Island serve as an early warning function only while those on the lower Labrador – Newfoundland coast have an early warning and weapons control capability. Thus, because the function of these two radars is being superseded by the four prime radars comprising DEW East there is no longer any operational requirement to retain them. In addition they are very expensive both in manpower and money to maintain. The six gap filler radars situated below Hopedale and the Labrador-Newfoundland coast were installed to provide warning, from the ground up similar to that being provided by the mid-Canada Line across the 55th parallel. When DEW East and the G-I-UK barrier become operational the initial early warning function for which the gap filler radars were installed will be provided. In fact, the new warning facilities will provide the Goose NORAD Sector with more time in which to react to an attack which will, in effect, reduce the vulnerability of the SAC aircraft at Goose Bay and Harmon to surprise attack. The radar at Red Cliff is the land based radar contiguous with the Airborne Early Warning barrier between Newfoundland and the Azores. At 20,000" altitude this radar provides only 50 miles more coverage than the radar at Gander. In addition, the type of equipment installed at Red Cliff is now obsolescent and if retained would be difficult to maintain. Alternatively replacement with a modern equipment would be costly. The consensus is that the coverage provided by Red Cliff does not warrant either replacement of the existing radar with more modern equipment or the retention of the site in its present configuration when the AEW barrier is deployed to the G-I-UK area. The deactivation of the three prime and six gap filler radars will cause a reduction of approximately 600 United States Military personnel in Canada. In sum, the improvement to the early warning capability, i.e. DEW East and the G-I-UK barrier, becoming operational in July 1961 is such that the limited additional coverage provided by the prime radars at Frobisher Bay, Resolution Island and Red Cliff and the six gap filler radars in the Goose Sector does not warrant the high cost of operation.